Our recipe for Italian stuffed cabbage has a veal, Italian sausage, spinach, and rice filling. The filling may also be made with ground beef, pork, lamb, or a combination of meats. Variations of stuffed cabbage are made throughout Europe and the Middle East. Some recipes include rice, others have breadcrumbs, farro, dried peas, or lentils; some have a lot of chopped vegetables or no vegetables at all. But 2 things are certain, stuffed cabbage is a true comfort food and most people will claim that their grandma’s recipe is the best. Making stuffed cabbage takes some time as there are a number of steps involved. The cabbage rolls may be prepared a few hours ahead and kept refrigerated before baking. Baked stuffed cabbage also freezes well. Additional Parmesan cheese for serving. Bring a large pot (large enough to fit the whole cabbage) of water to a boil. Using a small, sharp knife, cut in a circle all around the core of the cabbage and remove it. Place the cabbage in the boiling water. After about 2 minutes, an outside leaf will start to come loose. Use tongs or 2 forks to pull it off and transfer it to a bowl. After another minute or so, the next leaf will come loose. Remove and repeat until you have 12-15 leaves. Allow the leaves to dry and cool. Use a small knife to trim the large vein on each leaf to remove some of the vein’s thickness. Heat the olive oil in a large skillet over medium-high heat. 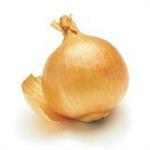 Add the onion; sauté for 3-4 minutes until translucent. Add the garlic; sauté for 1 minute. Add the spinach and sauté until completely wilted, about 2-3 minutes. Season the mixture with nutmeg, salt and pepper. Set aside to cool about 10 minutes. In a large bowl, combine the veal, sausage, rice, and spinach mixture. Season with salt and pepper. Use a wooden spoon or your hands to blend the ingredients well. Add the egg and Parmesan cheese; stir to combine. Spread half of the tomato sauce in a baking dish (about 10 x 13-inches). Put one of the cabbage leaves on a work surface with the bottom of the leaf closest to you. Place about 1/4 cup of the filling in an elongated mound at the base of the leaf. Roll the bottom of the leaf up and over the filling. Fold in the left and right sides of the leaf. Continue rolling the enclosed filling up to the top of the leaf. Place the cabbage roll, seam side down, into the prepared baking dish. Continue filling and rolling the remaining cabbage leaves. The cabbage rolls should fit snugly in the baking dish. Spread the remaining tomato sauce over the top of the cabbage rolls. Cover the baking dish and bake for 1 hour. 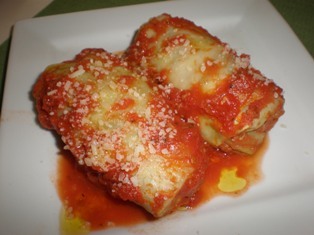 Place 2 cabbage rolls with a little of the sauce on individual plates. Sprinkle the top with grated Parmesan cheese. Drizzle with a little olive oil, if desired. If you don't have a set of plain white dishes, put this at the top of your must-have entertaining essentials. White dishes look sensational on the table by themselves or you can completely change their appearance on the table by pairing them with different accent plates, linens, and accessories. With white dishes and varied accessories, your table will never look the same for any occasion.